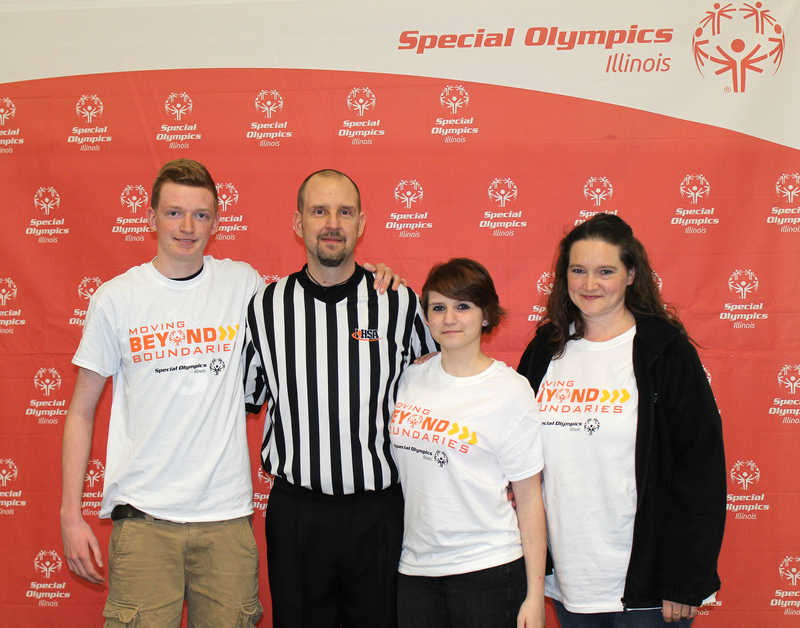 When basketball official Bob Henry of Plainfield arrived at the 2015 Special Olympics Illinois State Basketball Tournament in Bloomington-Normal on March 14, he brought more than his whistle and official’s jersey. His wife, Melanie, and children Brett and Amanda accompanied him to volunteer at the event. While Bob was officiating six games during the day, his family members were working as timers and scorekeepers on the same court. For Melanie and Brett, it was their first time volunteering with Special Olympics. Amanda had volunteered at an event in Joliet last year. “This organization does wonders for people without realizing it. I love being able to interact with the athletes and watch how much fun they have,” said Amanda. Volunteering together as a family “was a nice way for us to get away for the day and benefit others during the trip. This was their first time with Special Olympics and I do not think it will be their last,” said Bob.